Fresh off the press (released on 7th July 2017), this book tells the story of a journey around the world which occurred….. 35 years ago and was achieved by a young British woman. At that time, undertaking such an enterprise required a great deal of courage. Today’s traveller has a mobile, GPS, the internet, social networks and email but in 1982 you were definitely traveling alone. But what prompted the 23-year-old Londoner, Elspeth Beard, to leave her family and friends and her studies in architecture to undertake, all alone, an expedition of 55,000 miles around the world on a 1974 BMW R60/6? Ms Beard is still asking herself the same question today. At the beginning of the book, Ms Beard states in black and white the many doubts she had before leaving, the long and irrepressible tears, her desire to abandon the venture while there was still time … And, in the end, her doubts were put to rest by the realisation that she was the first British female to undertake such a challenge.Onto her motorcycle, Ms Beard loaded a tent, some clothes and some tools. And in her pocket she had the money she had saved while spending a couple of months working in a pub. The Motorcycle cost £900 and the odometer read 48,000 miles. At the beginning of the 1980’s, no one was really prepared to face a ‘round the world trip, let alone a woman. We’re talking about a period, pre-“electronic post”, where gathering up-to-date travel information was extremely difficult. Today, Google Maps has details for the entire world but at that time maps of certain countries were unobtainable. Ms Beard’s only certainty was her driving ability and skill. She had been motorcycling since she was a teenager and knew the mechanics of her BMW extremely well. By the time she returned to London nearly two and a half years later, she had acquired wise experience and a good number of permanent “scars”. In fact, she went through a lot and she tells us all about it in her book. 55,000 km AROUND THE WORLD FROM 1982 TO 1984. A REMARKABLE RESULT TO THIS DAY! Elspeth Beard waited 35 years before telling the world about her amazing challenge. 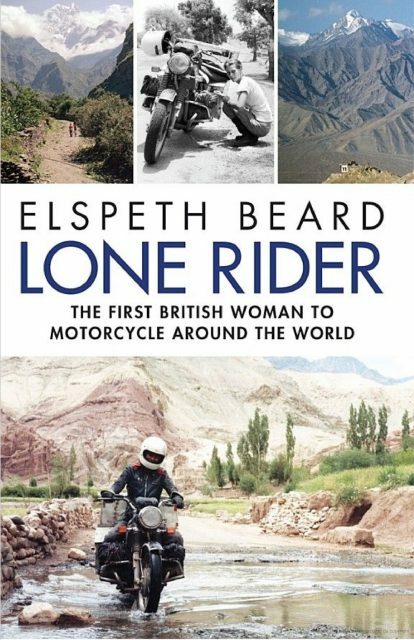 Her book Lone Rider has just been released but we are sure it will inspire today’s generation of motorcyclists. Upon her return home in 1984, the author was contacted and interviewed by many motorcycling magazines. She kept all the articles and left them in a box for decades. 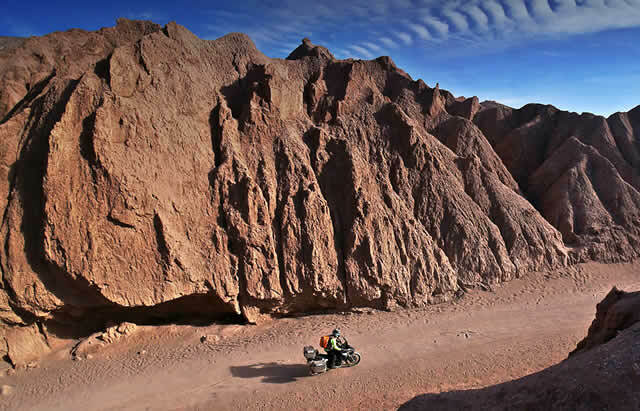 In 2008 someone remembered Elspeth Beard and wrote an article for BMW Motorrad. This helped her gain some public attention from the latest generation of adventurous motorcyclists. In 2014, Ms Beard’s story, finally available on the net, attracted the attention of a Hollywood agent who was interested in acquiring the rights to make a movie of her story. At that point, the idea of writing a book began to be considered. It was a logical step. Finding a publishing house was not difficult and the London based Michael O’Mara Books stepped in to bring the book to the public. Following is a brief outline of the main stages of the journey made by Ms Beard, where after departing from London, she headed west. After flying to New York, she picked up her BMW which was previously shipped ahead at a cost of £175 and she headed towards Canada, then Mexico and California. Embarking on a journey from Los Angeles to New Zealand and Australia where Ms Beard remained for seven months. Her first fall, a rather traumatic incident in Townsville, Queensland resulted in a two-week stay in hospital. A change of continent then began in Perth where the motorcycle left by sea, then boarded a flight to Singapore … where practically everything was stolen. BMW shipping documents, passport, money, visa … after fixing the problem the trip continued along the roads of Malaysia and Thailand and in the area of the Golden Triangle. After trying to reach India via Burma, Ms Beard headed south to reach Penang Harbour from where she embarked on a journey to Madras. Ms Beard’s health suffered the most whilst travelling between India and Nepal, where hepatitis and dysentery attacks were constant. Once in Kathmandu Ms Beard met a Dutchman, at the helm of a BMW Boxer, and with him she traversed the trail that took her back to Europe through Pakistan, the “revolutionary post Iran” … (with her helmet continually worn like a burka) and from there Turkey, Greece, Central Europe and finally the United Kingdom. When she left England, Elspeth weighed 65kg. On her return home, her weight had dropped to just 41kg.